Physiphora laevigata Sol. ex Ging. 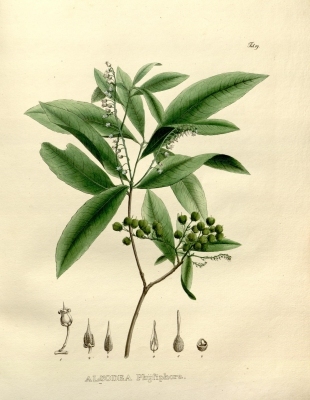 Illustration of the leaves, flowers and fruits. Lobolobo is a shrub or tree with a dense, spreading crown; it can grow up to 15 metres tall. A botanical journal, it includes a monograph on the American species of the genus Rinorea. It can be downloaded from the Internet. S. America - Brazil in the vicinity of Rio de Janeiro.